Crafty Andy: Sweater on the Go! 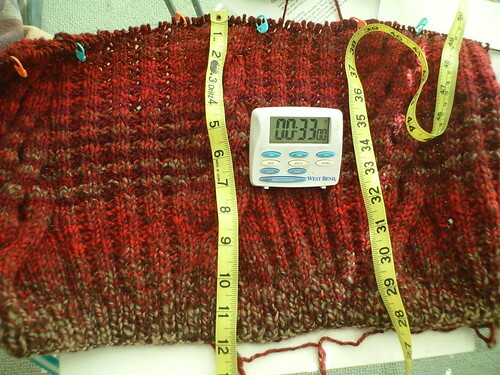 If you have many projects going on ,it is very nice to have a timer and time yourself per project. I have made some progress from yesterday on the back of the sweater. I am not sure if I want it to be 25 or 27 inches on the back. This material is very nice, is a combination of wool and acrylic that is perfect for the Coastal California weather. The hardest part of the sweater is the back, but is the one that gives the most satisfaction. Once you have the back covered, the front is just a few stitches away. I am enjoying the variegated yarns, Cinque from Lana Grossa which I added to the combo for stripping purposes and the other one from skacell, which I was not too happy about. There is nothing worst in the world than finding a knot on a skein of yarn. You would think that manufacturers would have known by now, but it happens and we have to deal with it, and so I did lol! Thanks for stopping by!